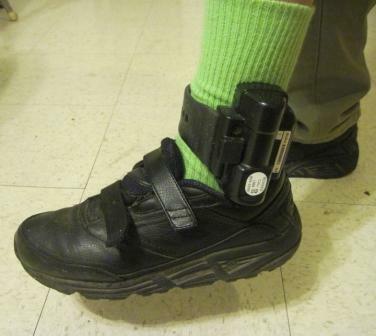 Joe Power Drutis reports that Bix has a new fashion accessory: his official Bureau Of Prisons ankle bracelet was snappe d on early afternoon on February 23rd. Bix has now joined the ranks of ankle bracelet veterans like Anne Montgomery, who also wore one after her release from prison. A bright spot: Bix cannot leave his house before 6 am ; but, he can go about his community building and ministry after 6 as long as he is back home before 9 pm! Ooooh, just think of the possibilities!!! And for those who are wondering how long Bix gets to wear this exotic piece of ankelwear, it’s for 6 months! He is going to have a ball doing the Hokey Pokey! Is this a fashion statement, or what??? war, capital punishment and abortion. as well as in word and sacrament. to Jesus’ Way of conquering evil. to renew the face of the earth. Amen. OUR LAMB HAS CONQUERED; LET US FOLLOW. Peter J. Ediger, poet, prophet and peacemaker, died in Las Vegas February 16 after a brief illness. Ediger resided in Las Vegas, where he co-founded Pace e Bene Nonviolence Service in 1989 with the Franciscan Friars of California. 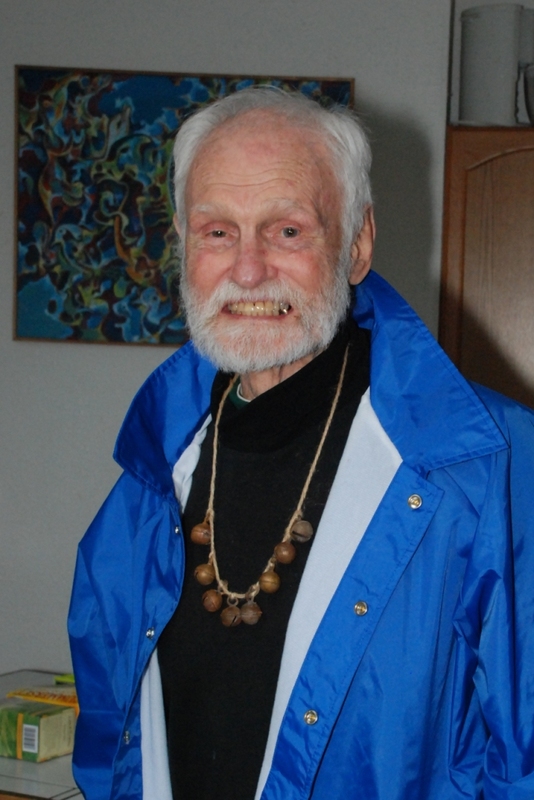 The lifelong activist and advocate for nonviolence, social justice and Christian pacifism had recently directed his prophetic words to local churches, challenging them to obey Jesus’ command to “love your enemies.” In addition to regular work with Pace e Bene, he worked part time for Family Promise and served as a member of the Las Vegas Catholic Worker and Nevada Desert Experience communities until near his death. Born to Jacob H. Ediger and Margaretha (Wiens) in central Kansas in 1926, Ediger was ordained by the General Conference Mennonite Church (now Mennonite Church USA) in 1954 and pastored several Mennonite congregations until 1986. He was preceded in death by ex-wife Marjorie Reimer Ediger and brothers Abraham and Menno, and survived by sisters Katherina Epp, Marie Regehr, Anne Martin, and Elma Kauffman; children Irene, Joe, Janice and Duane; and grandchildren Jack, Greta and Sallie. The memorial service is scheduled for 4:00 p.m. Tuesday, February 21, at Westminster Presbyterian Church, 4601 W. Lake Meade Blvd, Las Vegas. For more information, contact Duane Ediger, 312-523-9955. See www.peterediger.blogspot.com for a blog that follows events during Peter’s illness. The Pacific Northwest Antiwar and Radical History Project interviewed Bix in 2008 for a special section on anti-nuclear organizing in the Northwest. For those of you who aren’t familiar with Bix, here is a brief historical sketch from Matt Dundas’ interview with him on November 12, 2008. Bill “Bix” Bichsel was born and raised in Tacoma, where he now lives. A Jesuit priest, Bichsel is a long-time member of Tacoma’s Catholic Worker community, who commit themselves to social justice campaigns and working with the poor. As a teacher at Gonzaga University in Spokane, WA, Bichsel worked on fair housing and anti-discrimination campaigns, and later took part in anti-Vietnam War protests in Boston. 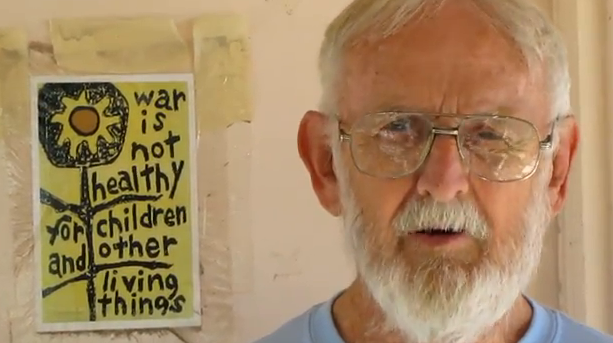 Upon learning from environmental activists about the nuclear weapons slated to be stored at Bangor Naval Base on Hood Canal, Bichsel joined the pacifist civil disobedience at the base, work he believes “made real” his commitment to nonviolent civil disobedience and the spiritual power of protest and resurrection. Click here to go to Bix’s oral history page at the Pacific Northwest Antiwar and Radical History Project where you can watch a number of videos of the interview with Bix, including one in which he describes his first act of civil disobedience, carrying a replica of the Trident nuclear submarine through a hole cut in the fence. Even as we experience the joy of our dear Bix’s release from prison and his good health, another peacemaker has experienced a dramatic decline. Peter Ediger, longtime peacemaker, was hospitalized toward the end of January due to serious medical issues. I do not have enough details to even begin to properly explain, but suffice to say that he needs for us to hold him deep in our hearts in this extraordinarily difficult time. You can follow Peter’s progress at the blog his son Duane set up at http://peterediger.blogspot.com/. If you’d like to send Peter a message, email it to Ryan Hall at Pace Bene, (ryanhall@paceebene.org), and he will be certain to get it to him. Bix is looking good and feeling fine!!! 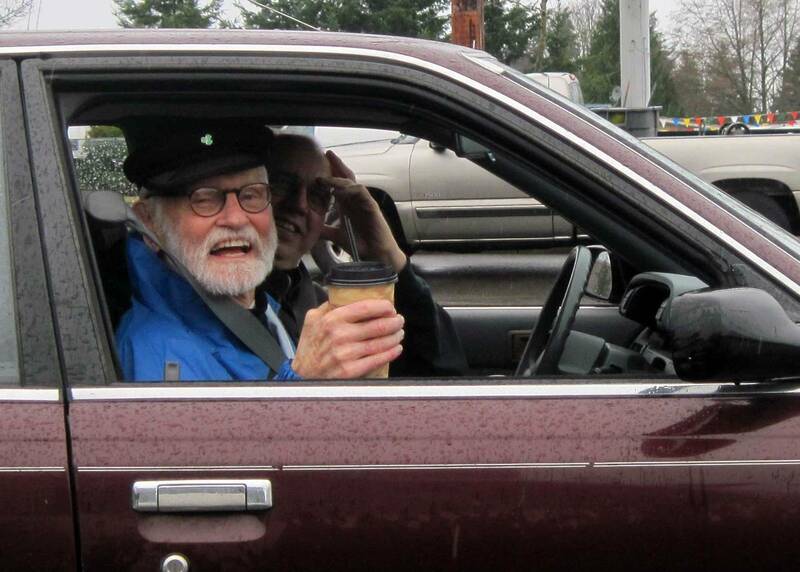 At 10:15 am this morning William “Bix” Bichsel, SJ was released from SeaTac Federal Detention Center. According to Theresa Power-Drutis, Bix’s first request was to “head over the bridge to Bangor.” His second request was a latte. His chauffeurs went for the second request. With all the milk he consumed during his liquids-only fasts while in solitary he seems to have rediscovered a desire for dairy products. Morning Latte... or another liquids only fast??? Shortly after Bix returned to his home (Jean’s House of Prayer at the Tacoma Catholic Worker) friends came and went throughout the afternoon to welcome him home. Everyone remarked how well he looked. It was obvious to all of us that Bix came out of prison (after a month in solitary confinement and a total of 19 days of fasting) in phenomenal form mentally, physically and spiritually. Sitting with friends at the kitchen table Bix wore a simple necklace of bells made in Cambodia from collected shell casings and other weapons of war, a fitting symbol of Bix’s deep desire to turn our swords into plowshares. At one point, after telling us of his prison experience, he moved the conversation to our shared work to eliminate nuclear weapons and create the peaceful world in which we are all meant to dwell together. Many people consider such vision a pipe dream. Sitting there with Bix I had a firm sense that his dreams do not come from any pipe. Rather, they emanate from a deep, abiding faith in God, a God who wants all of us to learn the lessons of peace and make war no more. I think we all have much to learn from Bix’s dreams, but even more so from his embodiment of The Word. He is truly The Word brought to life. And, it is good. P.S. – Two additional things: The Guadalupe Gala is this Saturday (Feb. 11th). Whether or not Bix will be able to attend depends on factors beyond our (or to a large extent Bix’s) control. One way or another it will be a festive and important event. More info by clicking here. Bix walked out of the SeaTac Federal Detention Center just a short while ago, and will soon be home at Jean’s House of Prayer at the Tacoma Catholic Worker! He would be happy to have visitors, and anyone is welcome to drop in today after 12:00 noon to give Bix a big hug and welcome home. Theresa Power-Drutis and company are ensuring that Bix has a comforable and safe ride home.